The Spainish team started their Confederations Cup campaign with a mainly dominating performance against Uruguay, earning a 2-1 win at the Arena Pernambuco in Recife. “I am grateful for the confidence Del Bosque has placed in me, and for my team-mates, with whom I’ve spent so many years bringing joy to the nation – that’s the nicest thing”, the Spanish captain added. 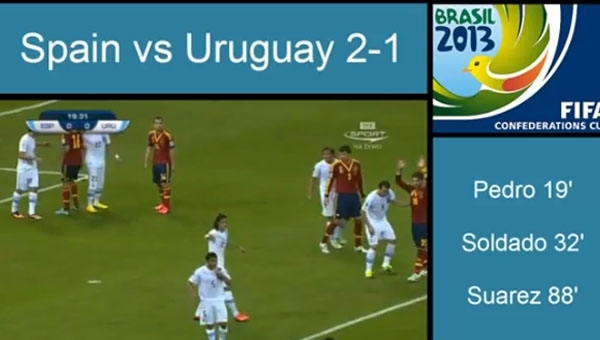 Goals from Pedro and Roberto Soldado paved the way to victory while a late Luis Suarez goal for Uruguay caused panic in the final few minutes. The victory puts Spain at the top of Group B with three points. La Roja next take on the islanders on Thursday in Rio.